Despite the finding of a legislative report that she had broken the state's ethics law in the scandal dubbed Troopergate, Alaska Governor Sarah Palin said Saturday that the report actually cleared her of any "legal wrongdoing or unethical activity." The report, which was released by Alaska lawmakers Friday, examined whether Palin abused the powers of her office by exerting pressure to have her ex-brother-in-law, an Alaska State Trooper engaged in a bitter divorce and child custody fight with her sister, fired. 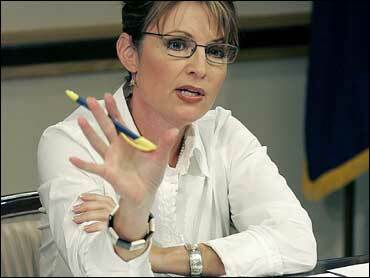 After the state's public safety commissioner Walter Monegan rebuffed pressure to fire him, Monegan was fired by Palin. The report affirmed that, as governor, she had the constitutional right to hire and fire at will, and therefore her termination of Monegan was lawful. However, the report found that Palin, her husband Todd, and her subordinates used pressure and intimidation to try to force the firing of Michael Wooten, beginning before her swearing-in ceremony took place, and therefore broke the law. The investigation said she violated Alaska Statute 39.52.110(a) of the Alaska Executive Branch Ethics Act, which states, "… each public officer holds office as a public trust, and any effort to benefit a personal or financial interest through official action is a violation of that trust." Palin said she's happy the report affirmed her right to fire Monegan. But she said she still doesn't think she abused her power like the report says she did. In fact, she said she considered herself vindicated. In a brief conference call with press reported by the Anchorage Daily News, Palin said, "I'm very, very pleased to be cleared of any legal wrongdoing … any hint of any kind of unethical activity there. Very pleased to be cleared of any of that." Palin said that her husband Todd was justified in complaining about Trooper Wooten (which the report finds he did for months on end), and said there was "nothing to apologize [for] there with Todd's actions, and again very pleased to be cleared of any legal wrongdoing." "I think that you're always going to ruffle feathers as you do what you believe is in the best interest of the people whom you are serving. In this case I knew that I had to have the right people in the right position at the right time in this cabinet to best serve Alaskans, and Walt Monegan was not the right person at the right time to meet the goals that we had set out in our administration. "So no, not having done anything wrong, and again very much appreciating being cleared of any legal wrongdoing or unethical activity at all." During the call she said she thought the investigation "did turn into a partisan circus." The Republican-led state legislature began the bipartisan investigation in July. Palin at first agreed to participate, saying that she had nothing to hide. However, once she was named to the GOP ticket in late August, her cooperation ceased. Subpoenaed witnesses refused to give testimony, and the state's Attorney General, a Palin appointee, tried to get a judge to kill the subpoenas, claiming they were not valid. The McCain campaign sought to characterize the investigation as a partisan effort aimed at undercutting her vice presidential bid, and was behind legal efforts to block the release of the report, or at least delay it until after Election Day. Palin's office had accused the head of the investigation of being partisan, when a Wall Street Journal interview with State Sen. Hollis French, a Democrat, implied that the Governor would face impeachment following the probe. French explained to the Anchorage Daily News that he'd told the Journal that nothing might come of the investigation or, in a worst-case scenario, it could lead to impeachment proceedings, but that the paper didn't use his entire quote. He said the Palin administration overreacted. After Palin stopped cooperating, more ink was spilled when French talked to ABC News. In a comment about the GOP's vetting process of Palin for the vice presidential spot, he said, "If they had done their job they never would have picked her. Now they may have to deal with an October surprise." That comment fueled criticism from the Republicans that the investigation was being turned into a smear job, despite the fact that Stephen Branchflower, the lead investigator, was a highly respected former prosecutor. While the report said Palin broke state ethics laws, it is not within the legislature domain to devise punishment, if any. That is up to the state Personnel Board, which is made up of three members appointed by the Governor's office. Palin herself re-appointed one member last year, and another member contributed to her gubernatorial campaign.